With New York Fashion Week in full swing, it's a good time to check out good deals on all the designer goodies sold at Neiman Marcus Last Call stores on eBay. I reviewed the Last Call stores earlier this year and really enjoyed shopping them for brands like Tracy Reese, Robbi & Nikki, Layfette 148, Juicy Couture, Rachel Roy, Theory, Vince, Vivenne Tam, Kenneth Jay Lane jewelry, Michael Kors, DVF, Free People and the jeans designed for curvy fashionistas everywhere, Not My Daughters Jeans. 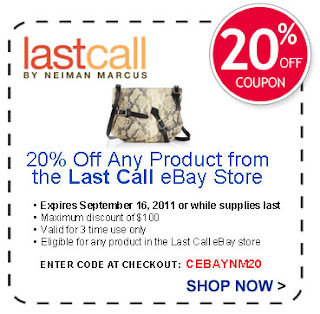 To get an extra 20% off on the Last Call eBay store, use the coupon code above to shop. Here's how. 1. Shop for any product on the Neiman Marcus Last Call stores eBay store. 2. Enter the coupon code CEBAYNM20 at checkout to save 20%.